Sure, the US government can ban incandescents light bulbs. But you really know their run is over when the lights in the monument to Edison's invention are replaced by LEDs. There is a tower in Edison, New Jersey, commemorating Thomas Alva Edison and his most iconic invention, the incandescent light bulb. For nearly 60 years the 19-ft. (5.8-m) replica of the first commercial light bulb at its peak glowed at night with the light of hundreds of incandescent bulbs. Which had to be replaced frequently, of course, and cost a mint to run. When the Edison Tower reopens this summer after a three-year renovation, its huge light bulb simulator will be illuminated by LEDs. New technology will also underpin the floodlights washing the buttresses to pick out the tower in the darkness. The inventions for which Edison is most famous came out of a brief period of six years during which he dreamed up and built the world's first research and development laboratory. Edison set up shop on 34 acres in the neighborhood of Menlo Park in what was then Raritan Township -- now Edison, New Jersey (renamed in 1954). He called his facility the Invention Factory. Edison and his researchers applied for over 400 patents in the years from 1876 to 1882, an unheard-of feat at the time. Among them were patents for the phonograph, the system of electrical power generation and distribution, and the incandescent light bulb. After Edison moved his workshop to West Orange, New Jersey, in 1887, the buildings of the Menlo Park campus were abandoned, then used for housing and as chicken coops. By 1929 most had deteriorated or been burned. Edison's close friend Henry Ford moved two of the remaining buildings to Dearborn, Michigan to anchor his reconstruction there of the Menlo Park laboratory complex. 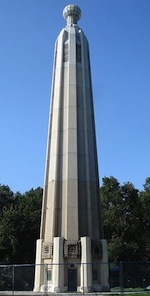 After Edison died in 1931, his family donated the 34-acre property to the state of New Jersey, and boosters in Menlo Park constructed a memorial tower on the site of the Invention Factory. It stands 131 feet (40 meters) high and is topped with a 19-foot (5.8-meter) replica of the first commercial light bulb, cast in segments by Corning Glass Works. The concrete, steel-framed, Art Deco-style tower is gradated dark to light as it ascends, and the huge bulb at the top -- originally illuminated by an array of incandescent bulbs -- completes the symbolic journey from darkness upward to light. The tower was designed to show well both by day and by night. After dark, hidden floodlights at the top (incandescent, of course) spilled light down the concrete buttresses, made of an aggregate that catches and scatters the light via glittering quartz and ceramic. The Menlo Park Museum site features a narrative on the tower's historical significance. By the 1990s the Edison Tower was beginning to need serious attention. The pre-cast concrete had begun to break down -- there is a telling photo on the site of the museum. Funds for restoration were hard to come by, and the tower was closed to the public in 2007 as a matter of safety. In the 2000s a renewed effort managed to come up with the nearly $3 million to undertake renovations. Work on restoring the tower began in April 2011 and is nearing completion. The tower is slated to reopen to the public in June of this year. The irony of superseding the Wizard of Menlo Park's most iconic invention with a modern replacement technology is not the end of it. The tower also commemorates the phonograph. An "audio room" halfway up contains displays of that breakthrough technology, and until the 1960s, music blasted from speakers around the tower and could be heard from two miles away (or so said the magazine Weird New Jersey). When the tower reopens, the audio technology behind those displays will be: MP3. The NJ.com piece linked above quotes experts on the question of whether or not the master would approve of the displacement of his technology by newer interlopers. The director of interpretation at Edison's museum, Kathleen Carlucci, thinks so. "Edison was all about innovation," she said. "This is just another innovation." "I think he would see [the changeover] as a good thing," opines Rutgers professor and Edison expert Paul Israel. "He was very aware of the inefficiencies of the electric light system... He'd have been even more pleased if [the LED technology] came out of his lab. If it came out of someone else's, maybe not so much."